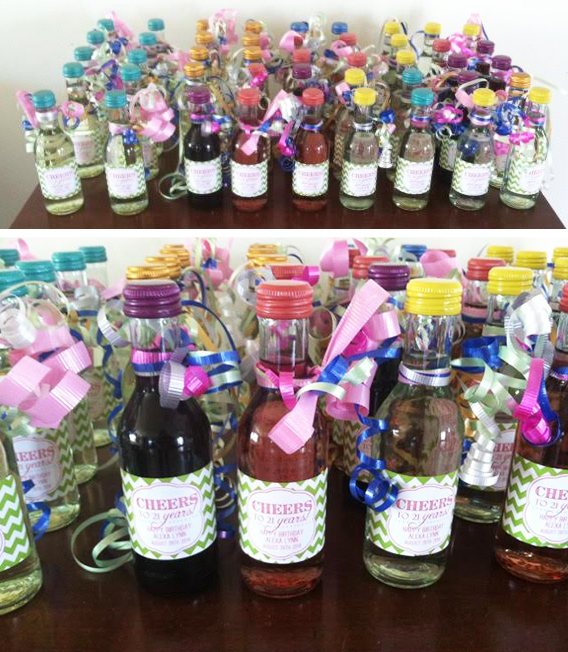 Sweet Sanity | Client Photos – Mini Bottles! 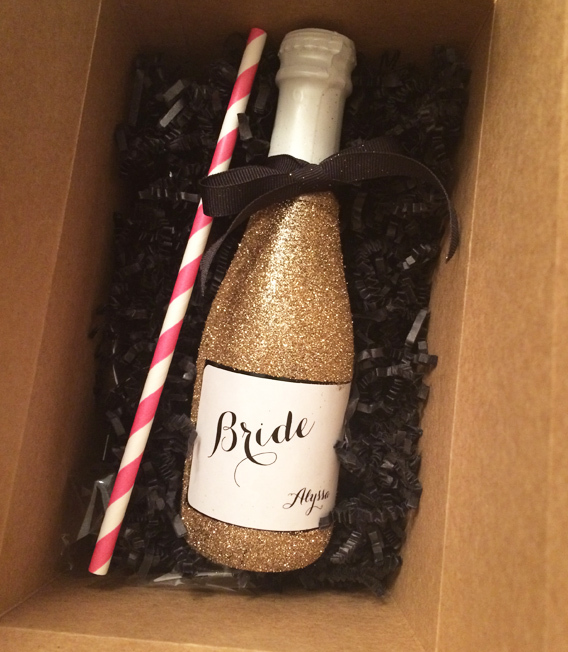 01 Jul Client Photos – Mini Bottles! It seems we churn out more mini bottle labels than anything else lately! I love when clients pop back sharing photos AND tips. Here are a few as of late! The party was great – the favors came out beautiful! I used your tip for soaking the mini wine bottles overnight in cool water as to not effect the wine inside – the old labels came right off, a little mineral spirits for any residue left over and then a quick wipe with a paper towel. It was pretty easy and I got tons of compliments on them. We wanted some colors, so we used an array of Barefoot mini’s -pink and regular Moscato’s, red and white Pinot’s, and a Reisling. The Barefoot mini bottles are a little taller than the Sutter and the bottles are glass instead of plastic; they were about $1.50 more per four pack. Thanks again!! 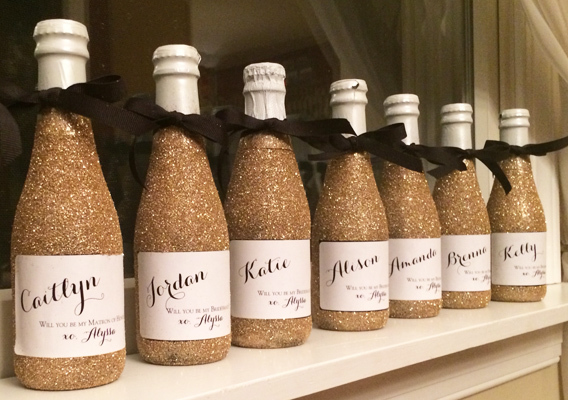 Cathy K.
Alyssa was a DIY queen and covered these bottles in gold glitter, labeled and then packaged individually with a little striped straw! Too cute! 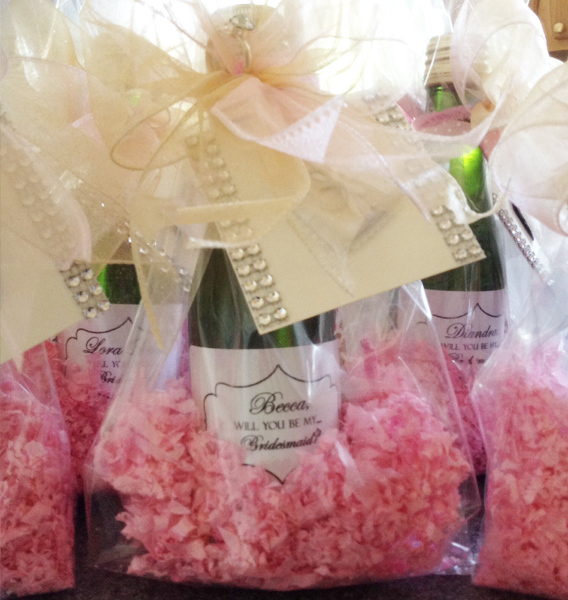 Carla placed each bottle in a cello bag and the filled with pink shredded filler, tied with bows and added some bling! 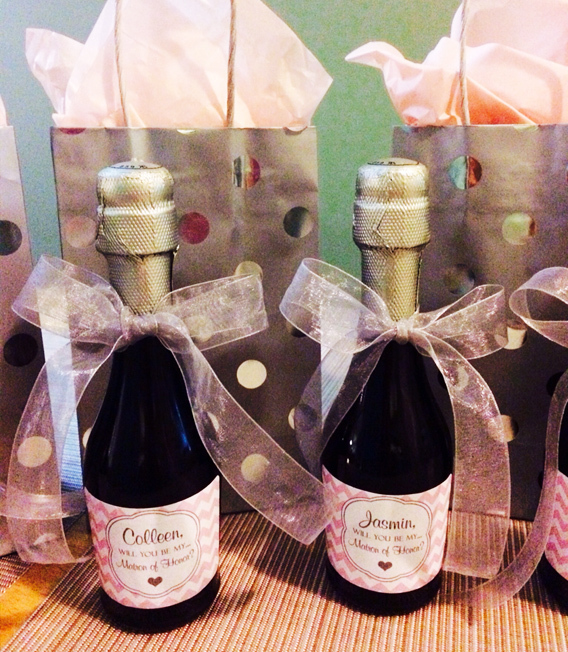 Courtney used our labels to create little gift bag bottles to ask the girls. Love the pink and grey theme! It is just really amazing seeing my labels out there and how each of our clients has taken them to the next level! Feel free to always share photos – I love them! Email sweetsanitydesigns@gmail.com if you’ve got one to share!